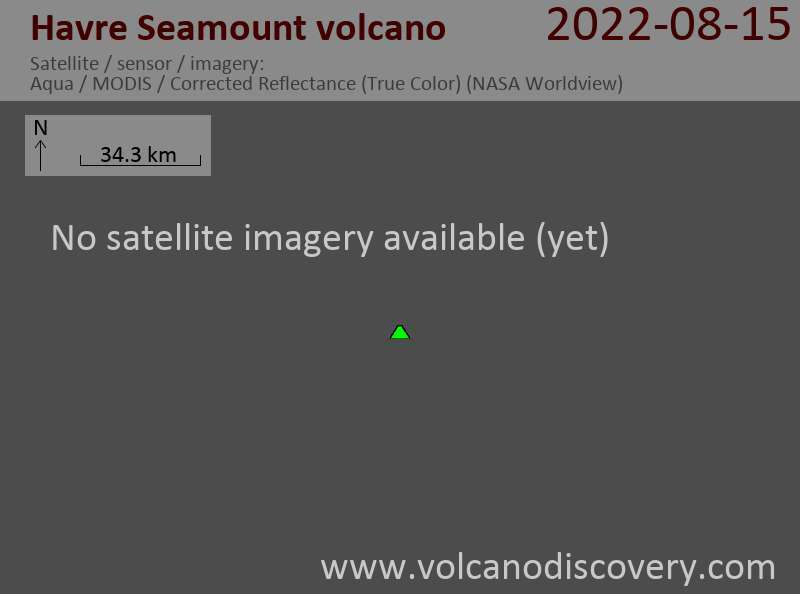 Havre Seamount is an active submarine volcano in the Kermandec Island arc about 75 SW of Curtis island. Little is known about the volcano. Its first document eruption probably started around 18 July 2012 and was discovered in August 2012 after a large pumice raft was discovered in the Kermandec islands, and scientist analyzed satellite recent pictures. Terra image of the Havre plume and pumice, taken on the morning of July 18, 2012. (NASA Earth Observatory & Eruptions Blog). Erik Klemetti (Eruptions Blog) and Robert Simmon (NASA Earth Observatory) "looked back through images of the area and found an ash plume and the beginning of a pumice raft on July 18, 2012, between Macauley Island and Volcano W."